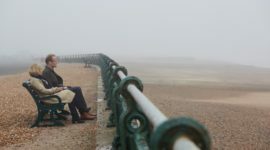 For CINECITY, Alexia Lazou spoke with Steve Sullivan, director of Being Frank, ahead of its screening in the festival on Wednesday 21 November. How did you get the job of telling Chris’s/Frank’s story? I made a documentary about Frank Sidebottom called Magical Timperley Tour back in 2006. It was a day in the life of Frank as he took his fans on an open top bus tour of the civic amenities of Timperley, on the very edge of Manchester. It was a great day involving trying to set a world record for cramming people in a chip shop, and seeing the two post boxes (one for left handed people, one for right handed people). I’d hoped the day would answer a lot of my questions about who Frank Sidebottom really was, but even though I met Chris Sievey that day and kept it touch with him, when he sadly died in 2010 I had far more questions than I had answers. You interviewed John Cooper Clarke, a legendary Mancunian in his own right. Was it difficult to get celebrity interviewees on board, or did they come forward eagerly? Mostly they were really happy to come on board just for the love of Frank Sidebottom or Chris Sievey. They all gave their time gladly as knew what Chris had been doing all those decades was something rare, an artist ploughing their own furrow, and they clearly respected the oddity of his message and the joy of his ramshackle performances. John Cooper Clarke even treated me to a private rendition of ‘Pies’, a lifetime highlight for me. Has the experience made you keen to tackle another feature length documentary or would you run a mile? In principle, if the idea was something I believed in this much, then I’d love too. Feature length docs are a great medium and I enjoy watching them as a viewer. I’m not sure I’d tackle making another film project in the same way again though. This is a film where I’ve directed, produced, edited, crowdfunded, researched, done the social media, made the teas, driven the van, booked locations, hotels, the lot. I’ve had some great help making it from some really talented people, but there’s also been long periods where it’s been a crew of one, which is partly why it took seven years to make. Knowing what I do now I’d probably want to structure the making of a film in a very different way so it isn’t such a marathon. But the way this film has been made, largely in my spare room, was right for this project and for a film about Chris/Frank who did everything in a homemade way too. Chris’s surname is pronounced ‘CV’, cunningly referenced in the film. Were you surprised by how many projects Chris had on his CV? 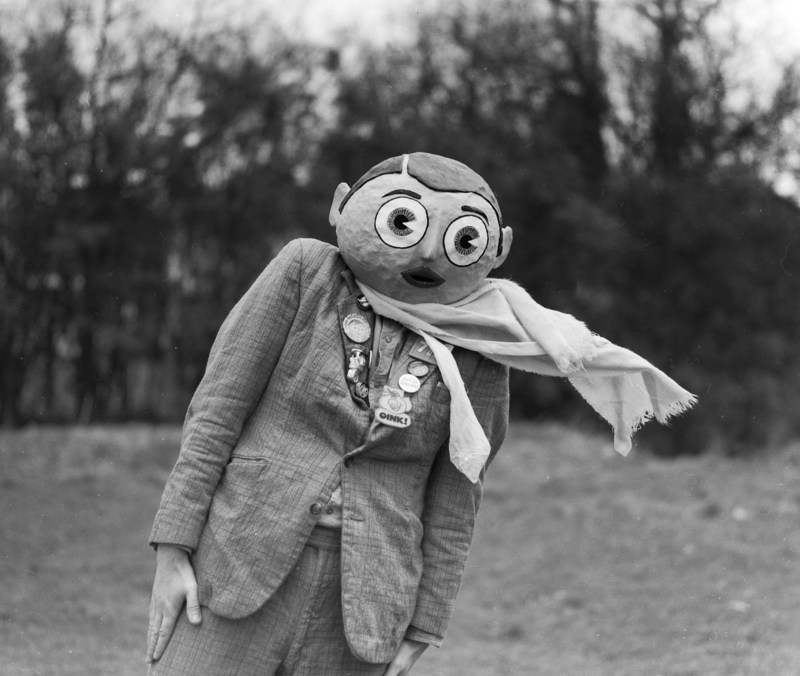 When I started making the film I had no real idea of what Chris Sievey had done over the years, as he’d deliberately hidden behind the Frank Sidebottom persona. Chris’s life was largely undocumented, and quite compartmentalised, meaning certain projects were only really remembered by the handful of people who worked with him on them. So as I tracked down more and more interviewees the story of what Chris had been up to just grew and grew. What started out as a simple investigation into who was the guy behind Frank Sidebottom’s head just expanded outwards into several lifetimes worth of worth and creativity in a really surprising and exciting way. The film is absolutely jam packed with his creativity and output, both as Frank and as Chris, but it’s still only the tip of the iceberg of what he managed to achieve. Frank Sidebottom has a huge following of fans but is still regarded as a cult figure. How would you sum up Frank in one sentence for someone who had never heard of him? I’d say he had nice smooth hair, a smart suit like a bank clerk, a pink tie, oh and a papier mache head. If that doesn’t intrigue you then he may not be for you! Your film was partially funded by Kickstarter. Was your choice of crowdfunding platform influenced by Frank’s love of football? Haha, Frank’s love of football is certainly documented in the film during the scene about his own Sunday league football team, The Timperley Big Shorts. The choice to go the Kickstarter crowdfunding route was purely that here was someone with a large fan base who wanted to know who their hero really was beneath the head as much as I did. So it was about getting everyone together as a community and asking them to help me get the film off the ground. 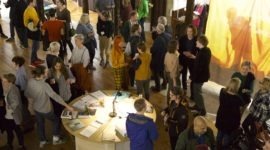 People ended up providing so much more than the initial funding to Kickstart the film. It led to Frank fans sending me hard drives packed with archive, stories galore, contacts for interviewees and all kinds of practical support. Someone even got in touch to lend us their house in Manchester for free while we were filming interviews. Sadly on the last day there we accidentally left the back door open for a week. It didn’t get burgled thankfully, which shows what a lovely part of Manchester Chorlton is to live! What is the future for Being Frank? Will it be released on video cassette? It’s coming out on Betamax and will be available down your local video shop as soon as its 1985 again. It’s also coming out in cinemas from spring next year. Until recently I’d have said a Custard Cream, but I had a few for the first time in years and honestly I wasn’t that blown away. So right now I’m between favourite biscuits, which is quite an exciting place to be. Thank you Steve for a fantastic interview and a fantastic film…you know it is, it really is. Thank you.